If you want to convert WMV to MOV on Mac then you know you have come to the right place. Here you will find out everything you need to know about the conversion process in general as well as finding out how you could benefit from getting the conversion done. WMV files are very versatile but in some instances you may need to convert them to MOV if you want to use them for other purposes. The problem with this is that it can be hard to find the right software and at the right price in this instance so you need to do everything you can to make the right decision with your download the first time around. In order to make this conversion work you would need to download a software that can do it for you. There might be internet converters out there but at the end of the day, you might not get a very good end result and it could take hours to do one simple file. You also need to think about what would happen if your internet connection was to drop halfway through the conversion, because in most cases you would end up losing the progress so far and everything you've done. 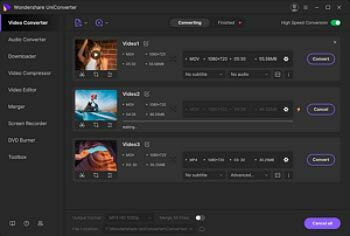 So as you can see, a downloadable converter is the best way to go and if you want to convert WMV to MOV converter for Mac then Wondershare UniConverter (originally Wondershare Video Converter Ultimate) is certainly the one you want to be looking at. This will give you all the results you need and it is a great way for you to keep up to date with the latest software. You can find this on the internet and it has never been easier for you to get started either. So when you have downloaded the Wondershare UniConverter (originally Wondershare Video Converter Ultimate), you will then need to import your WMV file. This is relatively easy and the software will talk you through everything you need to know as well so you know you won't have any problems there. It won't take you long to get started and you could see results before you know it! When you have imported your WMV and you are getting up and running, you will then need to set your output as MOV. This again, is very easy to do and you shouldn't have any problems. You can also select a different output if you have changed your mind at this point so you can get everything done quickly and efficiently. So what do you do when you have everything setup and done? Hit the convert button of course. When you hit the convert button, your file will start and all you need to do is sit back while the computer does the rest. You'll be notified when your file has finished and it's as simple as that! You may be wondering why Wondershare UniConverter (originally Wondershare Video Converter Ultimate) is the software of choice for this topic. It's because it is the fastest and most efficient converter on the market at the moment and it can effectively convert your file without losing out on quality as well. It is also very fast to download and easy to use as well so if you are not overly experienced with software or if you don't quite know your way around a computer program then you won't have any problems. Another thing you should know about is its Mac version Wondershare UniConverter for Mac (originally Wondershare Video Converter Ultimate for Mac) that a lot of programs don't offer. With Wondershare UniConverter (originally Wondershare Video Converter Ultimate), you can have it on your PC and MAC and this is ideal if you find that you work across multiple computers. You can try the software for free as well so if you don't want to pay out for something you are only going to use once then you can do this without any problems at all. Why don't you give this a go for yourself today to see what it could offer you? You would be surprised at how much you could benefit and there has never been a better time for you to get started either.